-architecture should not be hierarchic or representative. The building, a synthesis of 'kantoortuin' (office landscape) and office cubicles, consists of four quadrants separated by a neutral zone containing circulation, toilets and plant rooms, the latter marking the building's highest point. Three quadrants serve as office space, the other containing such general spaces as a restaurant, recreational areas and public functions. With its flexible, 'unfinished' structure the building can be easily added to. Centraal Beheer is built up using a repeated standard pattern, which collaborates closely with the supporting structure to fix the zoning of the interior. A blueprint for a building of this type is Hertzberger's own competition design for Amsterdam town hall (1968), a configuration of interlinked towers. The basic formal unit is a square of 9 x 9 m. subdivided by a cruciform zone into four corner areas of 3 x 3 m. The latter are variously subdivisible into individual work areas, the cruciform zones serving as additional work space or for circulation. This basic element constitutes an 'island', linked to others by bridges extending from the circulation zones. Sometimes it really is a case of islands and bridges where the intermediary space forms a void, inciting vertical and diagonal contact. The building's stepped composition generates a series of roof terraces. The islands are welded into a close-knit whole by the consistent and continuous structure. Two trusses, each of two columns spanned by a beam cantilevered at both ends, when placed parallel form a bridge between islands. Four such bridges then constitute with their cantilevers the supporting structure of one island, each of which is defined by four edge beams; linking these four bridges is a cruciform central element. The interior is determined by parapets of concrete block, and by the use of standard furniture. Although the office floors have seen some degree of adaptation over time the main shape of the building has survived all those years unscathed. 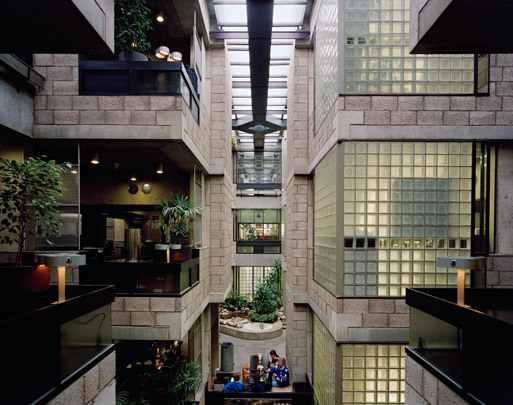 In the 1990s a glazed volume was inserted between the first Centraal Beheer office and Hertzberger's building. This insertion was to end all uncertainty as to accessing the complex and provide a better link between the two buildings. Housing a second 'building' for meetings and conferences, the extension is illustrative of the enormous advances made by Hertzberger's architecture in the intervening decades.